Have you ever had it or heard of it? In case you haven’t, I’m here to tell you it’s ridiculousy delicious. My mom makes a killer one. It’s good. Really, really good. 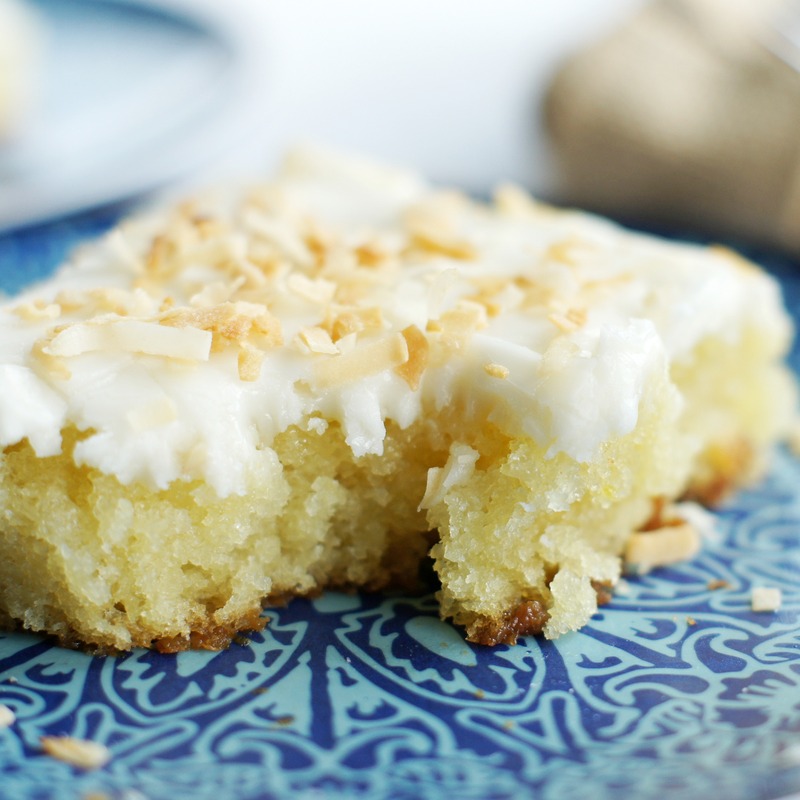 The cake is normally made with almond extract, which is fabulous, but I decided to swap it out for coconut extract . . . it’s scrumptious. One of the best parts about this cake is that you pour the frosting over the warm cake, so it kind of seeps in and makes this cake so incredibly moist, it kind of just melts in your mouth, which if you ask me, is completely a good thing. In a large saucepan, bring the butter and water to a boil. Remove from heat and stir in sugar, beaten eggs, sour cream and extract. Add flour, salt and baking soda, stir until well combined. To make frosting: In a medium saucepan, bring butter and milk to a boil. Remove from heat and add powdered sugar and coconut extract. Mix until smooth. Pour over warm cake. If you want to use the almond extract instead, use 1 tsp. in the cake and 1 tsp. in the frosting. If you want the almond flavor a little stronger, feel free to add a little more. If you do use almond extract, how much? Hi Jolynn! Good question, I’ll make sure I add a note to this post. Use 1 tsp. in the cake and 1 tsp. in the frosting. That’s a great idea Jen. 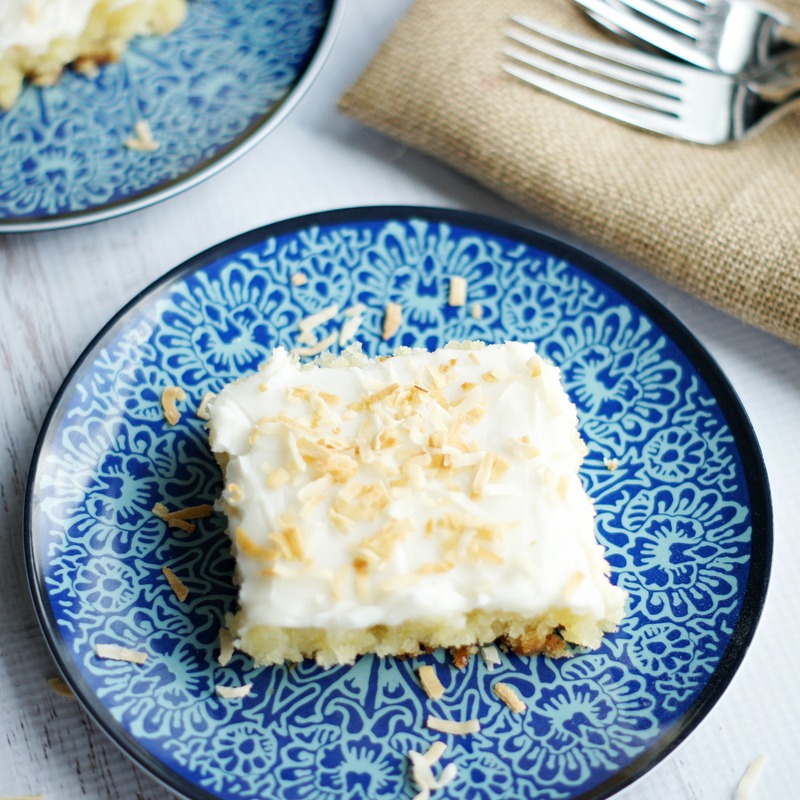 I actually thought about doing that too next time I make this, just because I love coconut and the more coconut flavor, the better. Thanks for looking! Can this cake be done in a 9×13 pan, sounds just awesome, thank you and hugs to you and your’s. I’ve never tried it in a 9×13, but I think it’s worth a try. The cake layer will obviously be much thicker and you will have to adjust your baking time. Just make sure not to overfill your 9×13 pan, you may have to not use all the batter. This looks excellent! I will try making it gluten-free and will also use the tip above to use coconut milk for some of the water and leave out the coconut extract. I love almond extract anyway so will add a little of that. Thanks for posting! Yum! Let me know how it turns out Tiffany. The article in the CS monitor said not to add the eggs to the warm butter or it will be like scrambled eggs. Is this correct? I’ve never had a problem with the eggs becoming scrambled. Just beat them before and add them with the other ingredients. I love, love this recipe. I have made it with vanilla, orange, and lemon extract. 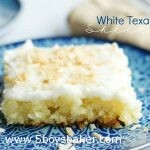 I have even tried it with peanut butter (your recipe) always a huge hit. Such a yummy and dense cake! Enjoy all of your recipes…you are my Go To Gal for everything i want to try or find. Thank you so much Tracie! Love the idea of lemon and orange, I’m going to have to try that. Thank you for leaving a comment, I really appreciate it! Let me know how it turns out in the 9×13 and how much batter you use in the pan and how many cupcakes you end up with. I am so in love with this cake. Now I want to go make it. Enjoy!